Using Cloudinary’s Cloud Service - Cloudinary is a media management service has support for uploading, manipulating and managing all kinds of media files, including images, videos and audio to emerging media types. 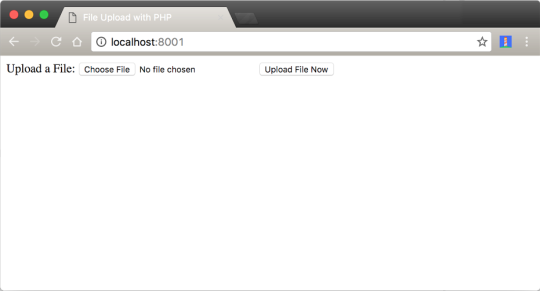 Cloudinary also provides an API for fast upload directly from your users’ browsers or mobile apps. Check out Cloudinary’s documentation for more information on how to integrate it in your apps. In the code above, we have a form with one input field and a submit button. The form tag has an action attribute that points to the script that will take care of the actual upload process. It also has a method attribute that specifies the kind of operation this form will undertake, which is a POST action. The value of the enctype attribute is very important. It determines the content-type that the form submits. If we were not dealing with file uploads, then we would not specify the enctype attribute on the form in most cases. Note: Different browsers, such as Safari, Edge, Firefox and Chrome might display the form in different ways. There are lots of things to consider when dealing with file uploads. I’ll highlight the common ones in form of questions. In which directory will the files be stored? What type of files should the users be allowed to upload? What types of browsers should support the upload? What is the maximum file size that the server should allow? Should the user be allowed to upload the same image more than once? $fileName = $_FILES['myfile']['name']; This refers to the real name of the uploaded file. $fileSize = $_FILES['myfile']['size']; This refers to the size of the file. $fileTmpName = $_FILES['myfile']['tmp_name']; This is the temporary uploaded file that resides in the tmp/ directory of the web server. $fileType = $_FILES['myfile']['type']; This refers to the type of the file. Is it a jpeg or png or mp3 file? $fileExtension = strtolower(end(explode('. ',$fileName))); This grabs the extension of the file. $uploadPath = $currentDir . $uploadDirectory . basename($fileName); This is the path where the files will be stored on the server. We grabbed the current working directory. In the code, we are checking to ensure that only jpeg and png files can be uploaded. // Checks to ensure that only jpeg and png files can be uploaded. We are also checking that only files less than or equal to 2MB can be uploaded. Note: Before you try out your code again, you need to ensure that there are some configurations in place. Make sure the uploads/ directory is writable. Run this command: chmod 0755 uploads/ on your terminal to make the directory writable. Now, run the code again. Your file should upload successfully to the uploads directory. Note: There are many checks you should consider when handling file uploads, including security precautions . You really don’t want someone uploading a virus to your web server. Do you? So by all means don’t use this exact code above in production. Add more valuable checks! Also, it’s recommended that you upload your files to a dedicated file server, not just your web application server. Check out the source code for a tutorial. 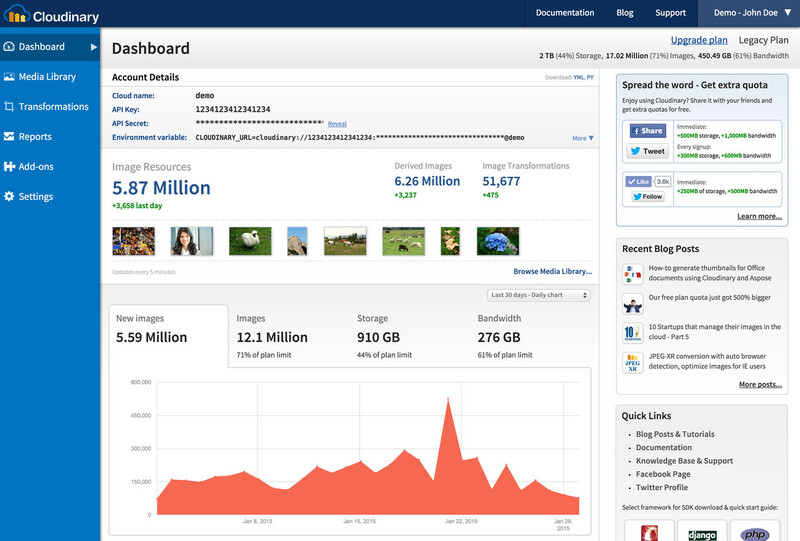 Cloudinary provides an API for uploading images and any other kind of file to the cloud. These files are safely stored in the cloud with secure backups and revision history. Cloudinary provides a free tier where you can store up to 75,000 images & videos with a managed storage of 2GB. 7500 monthly transformations and 5GB monthly net viewing bandwidth. The process is this simple! Cloudinary Dashboard - Your cloud name, API Key, Secret are key valuables to interact with Cloudinary functionalities. For more details, see the PHP getting started guide. Note: I recommend that you load these key valuables from an environment file (.env) to avoid people getting ahold of your config details. You can put this in a file called settings.php and just include it in the script that performs the actual uploading. Note: Every file uploaded to Cloudinary is assigned a Public ID that can later be used for transformation and delivery. Let’s cover a few examples of what can be passed to the $options array argument. Note: See here for all available upload options.